Catherine Hayes (1818-1861) was born in this house 200 years ago on 25 October 1818, and was baptised in Saint Mary’s Cathedral, Limerick, two weeks later on 8 October 2018. Catherine’s father, Arthur William Hayes, was a bandmaster in the local militia. Her mother, Mary Carroll, was a servant in household of the Earl of Limerick on Henry Street. Arthur and Mary were married in Saint Michael’s Church, Limerick, on 18 January 1815. They were the parents of four children: Henrietta, Charles, Catherine and William. All four children were baptised in Saint Mary’s Cathedral, but the two boys, Charles and William, died in infancy. Arthur William Hayes abandoned his young family around 1823. There is no further record of him in Ireland, and Mary was left to struggle to bring up two small girls. Catherine’s childhood poverty and her lack of early formal education make her achievements truly remarkable. She never forgot those years and her family’s plight and her humble origins when she later achieved international fame as an opera singer. She provided for her mother and sister, and insisted in her contracts that their needs, room and board were included. Catherine’s talents are thought to have been first discovered by Bishop Edmund Knox (1772-1849), the Church of Ireland Bishop of Limerick (1834-1849), when he heard her singing in the garden of the Earl of Limerick. Bishop Knox was impressed by Catherine’s raw talent. After meeting her, he gathered together a number of leading Limerick citizens to hear her sing. This was sufficient to set up a fund for Catherine to receive vocal and music training. Catherine’s progress was excellent, and on the advice of a prominent Dublin-based musical family, the Pigotts, she took singing lessons with Antonio Sopio. She then went on to study in Paris under the Spanish vocal coach Manuel Garcia, and she made her Italian debut in 1845 in La Scala. She had a remarkable career across the world, singing in the European opera houses from La Scala in Milan to Covent Garden. 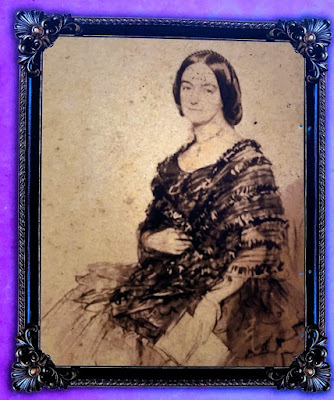 She performed to universal acclaim, contributing to the culture of Europe, until she died in 1861 at the age of 42. 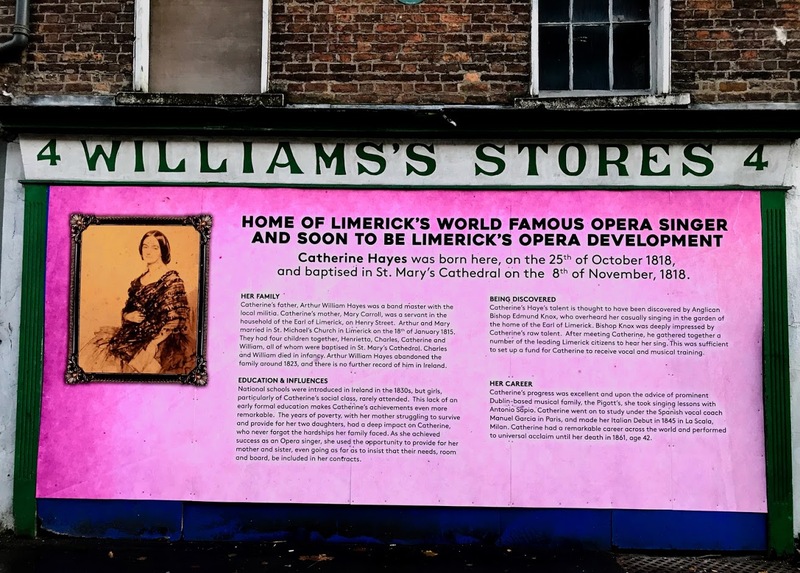 The name of Catherine Hayes was once synonymous with Limerick, and she was a contemporary of Jenny Lind. 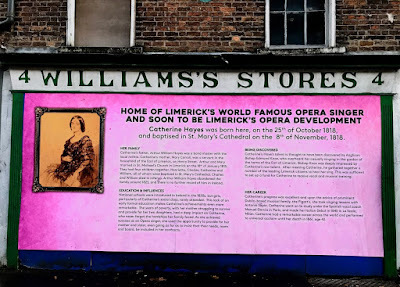 However, unlike Jenny Lind, she has not retained that worldwide recognition, and she has all but disappeared from Limerick’s known heritage. A Gala Concert celebrating the 200-year anniversary of Catherine Hayes takes place in Saint Mary’s Cathedral, Limerick, on Thursday next [8 November 2018] at 8 p.m. 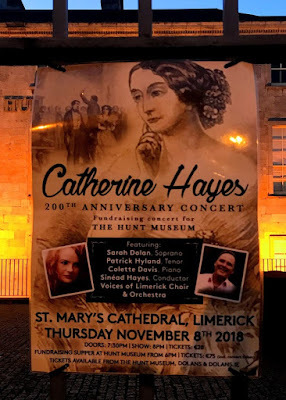 The concert aims to reintroduce the story of Catherine Hayes and to give her deserved recognition in her home city. Her story will surprise, fascinate, educate and stir debate. The concert features Sarah Dolan (soprano), Patrick Hyland (tenor), Colette David (piano), Sinéad Hayes (conductor), the Voices of Limerick Choir and a 30-piece orchestra. The concert will include selections from operas by Bellini, Donizetti and Verdi and some favoured Irish art aongs by Thomas Moore, Balfe and GA Osborne, who was the organist in Saint Mary’s Cathedral during her lifetime, as well as her party piece, ‘Kathleen Mavourneen’. Doors open at 7.30 p.m., and tickets cost €28 each. In addition, there is a fundraising supper earlier that evening at the Hunt Museum at 6 p.m. Tickets are €75 and include concert tickets, and proceeds from the combined ticket will go towards planned Hunt Museum refurbishment works. Autumn and harvest are turning towards Remembrance in November. Soon, Advent brings us towards expectation of the peace, promises and hopes of Christmas. The 100th anniversary of the Armistice that brought an end to World War I falls on Sunday 11 November. The Remembrance Sunday Service at 11 a.m. on 11/11 in Holy Trinity Church, Rathkeale, is a united service for the group of parishes, with a time of silence and commemoration at 11 minutes past 11. This includes a short Parish Eucharist (Holy Communion 2), and Sunday School facilities are available for children. 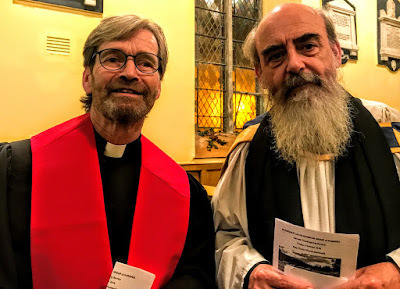 The visiting preacher at the Group Harvest Thanksgiving Service in Holy Trinity Church, Rathkeale, this year was the Revd Michael O’Sullivan of the Non-Subscribing Presbyterian Church, Cork (Cork Unitarian Church). The traditional Harvest Auction in Rathkeale No 2 National School was conducted by Councillor Adam Teskey with characteristic panache and good humour. The funds raised at the Harvest this year are being donated through the Bishops’ Appeal Fund to relief work in Indonesia following the recent earthquake and tsunami. The recent ‘clothes swap’ evening in the Rectory (28 September) was a fun evening and raised over €500 towards building children’s playgrounds in remote rural villages in Morocco. The clergy and readers in the diocese are being encouraged to find ways of working closer together in Ministry, Mission and Hospitality, in identifiable areas or districts. A number of meetings have taken place in both the bishop’s house and the dean’s office in Limerick. Priests and readers in Co Limerick are being invited to a ‘Ministry Lunch’ in the Rectory in Askeaton on Wednesday 14 November. Our neighbours, the Revd Liz Beasley (Adare) and the Revd Jim Stephens (Tralee) are being installed as canons in Saint Mary’s Cathedral, Limerick, on Sunday 25 November. Shirley Sheahan began new Sunday School activities in Holy Trinity Church, Rathkeale, on Sunday 9 September. All children in the Group of Parishes are welcome at Sunday School in Rathkeale on the second and fourth Sundays of the month. The Liam McCarthy Cup was brought to Askeaton recently [30 September] by members of the winning Limerick All-Ireland team as part of the Ninth Memorial Day organised by Eas Geithne Cumann Lúthcleas Gael (Askeaton GAA). Earlier in the day, the cup was in Saint Mary’s Church (RC), Askeaton, for the Memorial Day Mass. 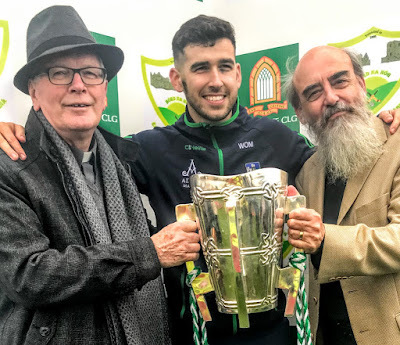 When the cup was brought to the GAA Field, near the Rectory, Canon Patrick Comerford and Father Seán Ó Longaigh, Parish Priest of Askeaton, lifted the cup with Willie O’Meara, who plays full-back on the Limerick winning team and on the Askeaton team. A little earlier, as part of the celebrations marking the 150th anniversary of the discovery of the Ardagh Chalice and the Ardagh Hoard in West Limerick, the Sam Maguire Cup was brought to the Culture Night in Ardagh on 21 September. The next Ministry Training and Education day takes place in the Rectory, Askeaton, on Monday 12 November, looking at how to select hymns and music for church services. This is being led by the Revd Rod Smyth (Nenagh) and Ms Rosemary Smyth, and is open to all priests and readers in the diocese. The October training day in the Rectory looked at preparations for this year’s Remembrance Day commemorations. Thursday 1 November (All Saints’ Day): 11 a.m., the Eucharist (Holy Communion), Saint Mary’s Church, Askeaton, followed by tea/coffee in the Rectory. Sunday 4 November (Fourth before Advent): 9.30, the Eucharist (Holy Communion), Saint Mary’s Church, Askeaton; 11.30, Morning Prayer, Saint Brendan’s Church, Kilnaughtin, Tarbert. Sunday 11 November (Third before Advent, Remembrance Sunday): 11 a.m., Holy Trinity Church, Rathkeale: Remembrance Day Service, followed by Holy Communion. This is a united service for the group of parishes, with a time of silence and commemoration at 11 minutes past 11, on 11 November. Sunday 18 November (Second before Advent): 9.30, Morning Prayer, Saint Mary’s Church, Askeaton; 11.30, the Eucharist (Holy Communion), Saint Brendan’s Church, Kilnaughtin, Tarbert. Sunday 25 November (The Kingship of Christ): 9.30, Morning Prayer, Castletown Church; 11.30, the Parish Eucharist (Holy Communion 2), Holy Trinity Church, Rathkeale (with Sunday School). Saints’ days in November: 1, All Saints’ Day; 30, Saint Andrew.